Living a creative life isn’t easy in this world of constant distractions and doubt. We wonder if what we are doing is right. We wonder if we should do this or do that. We fear what others might think if they find out exactly what we want or exactly how we think. We fear judgement and scorn. We fear failure. We fear success. 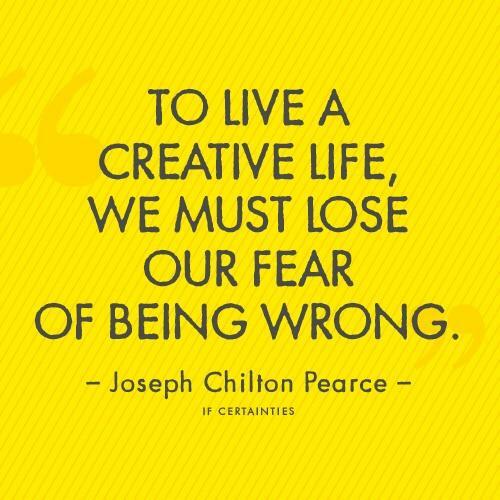 We fear doing the wrong thing. But even with all this tumbling in the back of our minds, we still feel the need to live our life the way we want to. That pull. That desire to just be us. It’s not just enough to live. We want to live a creative life. We want to be expressive. We want to experiment. We want to try new things. We want to do more than what we are doing. We want to be more than what we are, or maybe just a better version. We also worry about how much we are getting done. Is our life where it should be? Shouldn’t we be doing more? Shouldn’t we be farther along than we are? One of my favorite ways to keep myself on track is to reflect on my life every now and then. I do this to remind myself that even if I don’t feel like I get much accomplished — in reality I actually do. My life changes so much and in such a short period of time that I can reflect from one month to the next and notice the sizable difference in who I am and the great number of things I have accomplished — In just a month. Something that has become a habit for me is doing a reflection writing on the same day each year. I did it once by complete accident and I happened to notice the massive change in how I thought and the things I did in one year’s time that now it’s become a tradition for me to reflect that same day every year. For the last three years, I have written about two pages worth of reflection and goals that I accomplished or want to accomplish in that year and the next on each April 20th. This exercise has proven to be extremely eye opening about myself and the way life works (or at least for me). One thing I have noticed is I get a whole lot more done in a year than I think I do, especially in my writing. Also, the way I approach or think about things change drastically from year to the next. And probably the most revealing, is the tone of my writing. The first entry is quite dismal and negative and each year after has become more positive and upbeat. I love these reflections because it shows me where I have been and where I want to go in such a clearer way than I could express in any given moment. It gives me a frame of reference for my ever changing self. And I have become convinced that in order to live a full and rich life, especially a creative life, one must regularly hit the pause button on their life and take time to reflect. Life is crazy, exciting, and constantly changing. The journey is moving us forward. The places we go, the people we meet, the things we choose to do and not do, they define us and make us who we are. Are we living the life we want to live? Are we maximizing a truly creative life? Are we on track to reach the potential that is inside us? These are questions that can only be answered on an individual and private basis. But somethings I have learned in my creative journey. Love life. Live it to the fullest you can in that moment. Don’t let the little things get you down. And that big problem you’ve been struggling with that seems insurmountable, won’t even be a thing next year this time (I promise!). Be thankful for everything. Love and appreciate those closest to you (and make sure they know it!) to the fullest. Take that chance. Make that move you’ve been putting off. Publish that book you’ve been working on for five years. Most important… don’t be afraid to be you. Live life — your life — the way that you want. You only get one. So make it count. Wonderful!!! I’m glad to hear all this positive reflection!!!! I write out a short note at the end of a year to cover what happened. I’m always surprised, like you, at all the stuff that goes on. It’s like – Wow! All that happened this year!?? Then I write a short note of what I would like to see next year. It is fun going back and reading these. Life is so much bigger than I plan.